Evan Lysacek has a history in Cleveland. When the city hosted the U.S. Championships in 2000, a 14-year-old Lysacek rallied from fifth place after the short program to claim the junior men’s competition. Now 23, the Naperville, Ill., native hopes to replicate that success when Cleveland hosts the 2009 U.S. Championships, Jan. 18-25. “I’m really, really looking forward to getting back to competition at the AT&T U.S. Championships in Cleveland,” Lysacek said. The men’s competition starts Friday with the short program and concludes Sunday. Accustomed to competitions from October through December, his fall season was cut short when his back-to-back bronze medals at Skate America and Skate Canada did not qualify him for last month’s Grand Prix Final. “It’s pretty much a blessing for me,” he said. 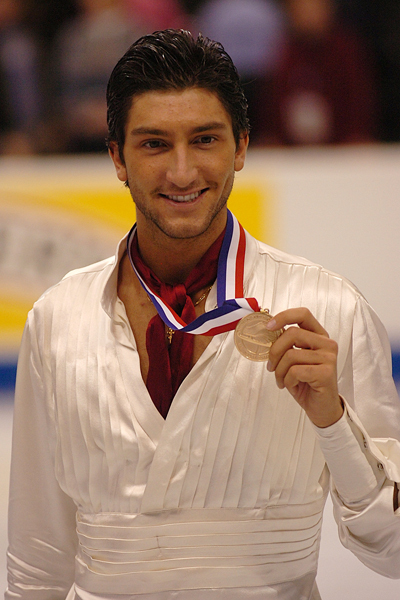 With the months between competitions, Lysacek had a chance to read a journal he kept leading up to his win at the 2007 U.S. Championships in Spokane, Wash. The journal focused on his preparations for nationals after missing the Grand Prix Final, that season because of an injury. He used his own words to inspire an intense training regiment leading into this year’s event. Competing under a judging system where fractions of a point separate competitors, no element went unlooked in the months leading to nationals. “Footwork, spins and jumps were getting different levels at every event, so I wanted [Nichol] to give me some concrete guidelines that I could follow and that’s what she did,” he said. He even changed his technique on the triple axel. A jump he performs once in the short program and two times in his free skate, the triple axel was a problem in the fall, when technical callers deducted points for Lysacek under rotating three-and-a-half revolution jump. The lost points likely cost Lysacek a spot in the Grand Prix Final, an event that two-time national pewter medalist Jeremy Abbott won, becoming the first American man to do so. Three-time U.S. Champion Johnny Weir finished third. He also worked on a quadruple toe loop. “I’ve been training the quad at home in practice, and I’ll decide on the day of the competition whether or not I think that it’s worth it to put it in or not,” Lysacek said. Likely factored into his game plan will be Weir, who finished ahead of Lysacek at Skate America, and a handful of other athletes planning to make Lysacek’s quest for a third title the hardest yet. Weir tied with Lysacek for the national title last year but Lysacek won a tie-breaker. Only fourth at nationals the last two seasons, Jeremy Abbott set the highest score ever recorded by an American in international competition at the Grand Prix Final. He became the first American ever to win while Weir finished third. Ryan Bradley, second at 2007 nationals and fifth last year, won silver at Skate Canada ahead of Lysacek. Reigning national bronze medalist Stephen Carriere won silver at Cup of China behind Abbott. Both could play spoiler to Lysacek’s three-peat along with the young guns like Brandon Mroz and Adam Rippon. The top three competitors from nationals move on to March’s World Championships, an event Lysacek withdrew from last year after injuring himself on a triple axel in practice. While most of the focus will be on Abbott, Lysacek and Weir, other Figure Skaters Online skaters are making the trip to nationals including Eliot Halverson, Nicholas LaRoche, Douglas Razzano and Scott Smith. The Cleveland area’s own Parker Pennington is also aiming for his first national medal on the senior level after winning both the novice and junior titles earlier in his career.